Swedish Style Potato Sausage (Potatiskorv) is from the United States. Potato Sausage originates in Värmland. Potato Sausage is called Potatiskorv in Värmland. In other parts of Sweden, Potato Sausage is called Värmlands Korv. Swedish Style Potato Sausage is made up of ground pork, beef, onions and potatoes. Swedish Style Potato Sausage is well known and sold commercially around Christmas throughout the country. Swedish Style Potato Sausage is approximately 1.0 pound package. Swedish Potato Sausage is frozen. Swedish Potato Sausage is perishable and may require additional shipping charges. Because of temperature variations throughout the USA, we may elect not to ship a food such as Potato Sausage order over a weekend to guarantee its arrival in perfect condition. We make every effort to package and ship perishable items such as the Swedish Style Potato Sausage safely. We are not responsible for any damages due to events beyond our control. 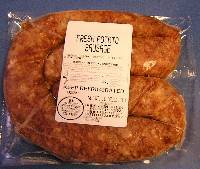 Perishable food such as Potato Sausage orders are shipped on Mondays & Tuesdays. Cold packaging is available for an extra charge of $11.95. Perishable orders will also incur additional shipping charges. We cannot guarantee MONDAY deliveries on any orders. We are sorry for any inconvenience. Our supplies of perishable items are limited during summer months. For more information regarding shipment of perishable items, please email us.